There are six Main Committees of the General Assembly. Each committee deals with a particular topic and is allocated agenda items according to the topic. A report is issued to the plenary for each item allocated to a Main Committee. All are committees of the whole: all UN member states participate in them. They are all entitled to meeting record coverage. From the 1st session (1946) through the 30th session (1975), General Assembly meetings and documents were consecutively numbered. At the 31st session, the symbols began to include the session number. 2004 note by the Secretariat regarding the working methods of the committees. 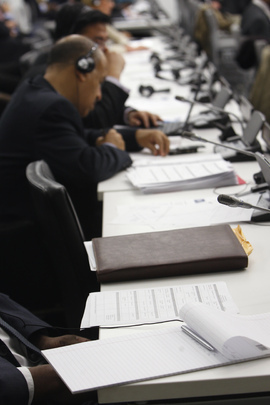 The First Committee, one of the six Main Committees of the General Assembly, is allocated agenda items related to disarmament and international security. For example, the General Assembly adopted resolutions 69/68, 69/69, 69/70, 69/71, 69/72, 69/73, 69/74 and 69/75 based on the report of the First Committee (A/69/441). The Second Committee, one of the six Main Committees of the General Assembly, is allocated agenda items related to economic and financial matters. For example, the General Assembly adopted resolutions 69/209, 69/210, 69/211, 69/212 and 69/213 based on the report of the Second Committee (A/69/468). The Third Committee, one of the six Main Committees of the General Assembly, is allocated agenda items related to social, humanitarian and cultural matters, including human rights. For example, the General Assembly adopted resolutions 69/163, 69/164 and 69/165 based on the report of the Third Committee (A/69/487). The Fifth Committee, one of the six Main Committees of the General Assembly, is allocated agenda items related to administrative and budgetary matters. For example, the General Assembly adopted resolutions 69/3, 69/262, 69/263 and 69/274 based on the report of the Fifth Committee (A/69/422 + Add.1 + Add.2). The Sixth Committee, one of the six Main Committees of the General Assembly, is allocated agenda items related to legal matters. For example, the General Assembly adopted resolution 69/123 based on the report of the Sixth Committee (A/69/502).